It's 11:12 in Samedan, Switzerland right now. Samedan: Engadin Airport, 0 miles away. Samedan: roundshot 360° Panorama Engadin Airport, 0 miles away. Celerina-Schlarigna: Panorama View, 1.6 miles away. Celerina-Schlarigna: roundshot 360° Panorama Lej da Staz, 1.6 miles away. Celerina-Schlarigna: roundshot 360° Panorama Cresta Palace Hotel, 1.6 miles away. Celerina-Schlarigna: roundshot 360° Panorama Celerina, 1.6 miles away. 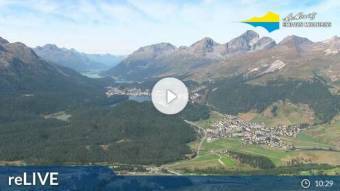 St. Moritz: Webcam Upper Engadine, 3 miles away. St. Moritz: Corviglia, 3 miles away.